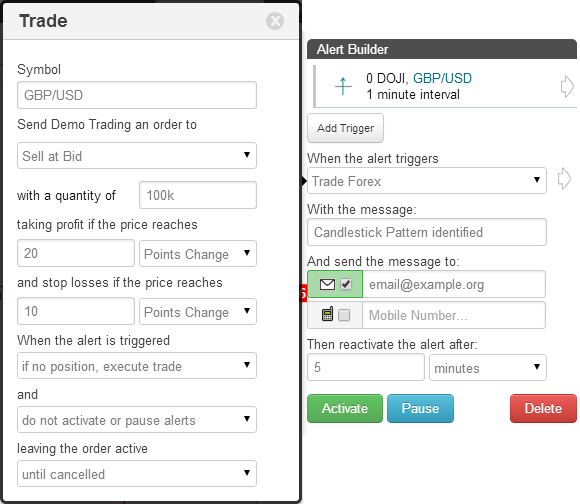 Use timetotrade to set up trading rules and receive alerts to your email and mobile phone as soon as your Bollinger Bands® chart investment conditions are met. You can set up alert that will notify if the price breaks through the upper or lower Bollinger Bands® or if the distance between the Bollinger Bands® increases or decreases. This is a very effective way of watching market volatility. You can also quickly backtest your alert based trading strategies. On timetotrade's Bollinger Bands® Charts, the Upper Bollinger Band® is a red line and the green line represents the Lower Bollinger Band®. You can adjust the indicator colours and default period and deviation parameter values to find the best fit between price movement and the Bollinger Band® indicators to suit you. 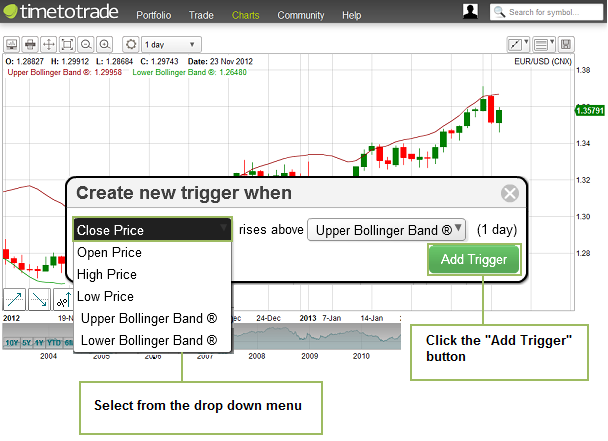 To create a Bollinger Band® alert, just click on the Alert Trigger Buttons to the bottom left hand side of the Bollinger Bands® chart. There are no programming languages to learn, no macros or complex formulas for you to write. Just click a button, enter your parameters, and remember to "activate" - and your alert is created. Simple! Rising Threshold Alert Trigger, is triggered when the value of the Bollinger Band rises above a specified value. Falling Threshold Alert Trigger, is triggered when the value of the Bollinger Band falls below a specified value. Break-Out Alert Trigger, is triggered when the Bollinger Band increases by a specified value within a the selected interval period. Pull-Back Alert Trigger, is triggered when the Bollinger Band decreases by a specified value within a the selected interval period. Percentage Break-out Alert Trigger, is triggered when the Bollinger Band increases by a specified value within a the selected interval period. Percentage Pull-back Alert Trigger, is triggered when the Bollinger Band decreases by a specified percentage within a the selected interval period. 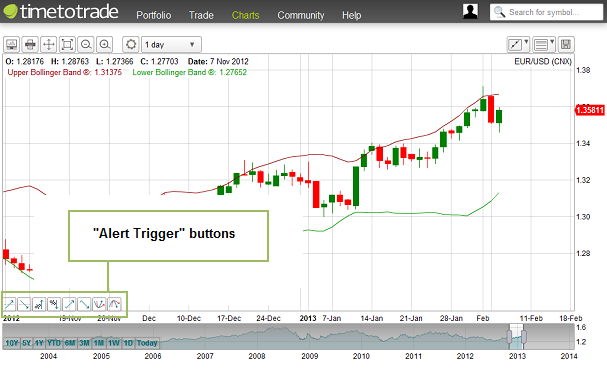 Above Alert Trigger, is triggered when the Bollinger Band is above a specified value. 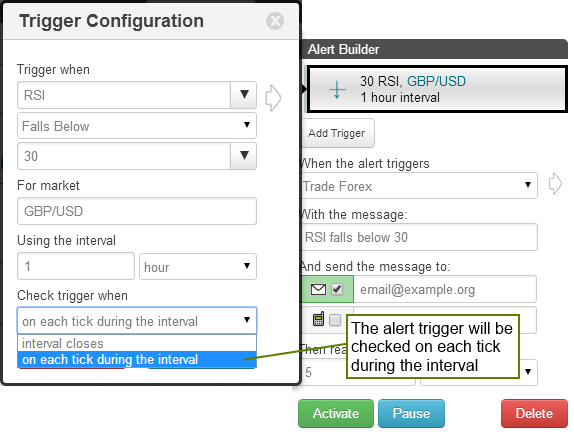 Below Alert Trigger, is triggered when the Bollinger Band is below a specified value. 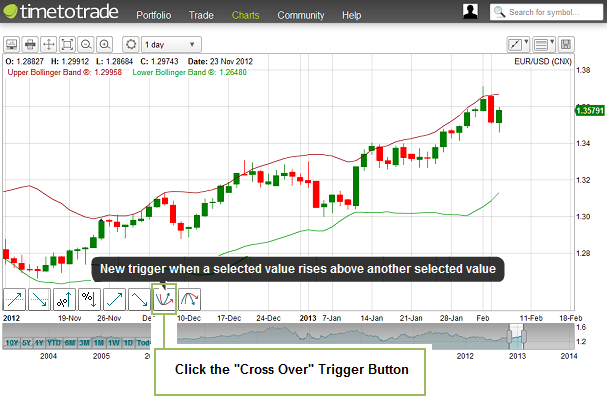 Positive Crossover Alert Trigger, is triggered when the Bollinger Band rises above / crosses over another indicator, price, a specified value or trend line that you have drawn on the chart. 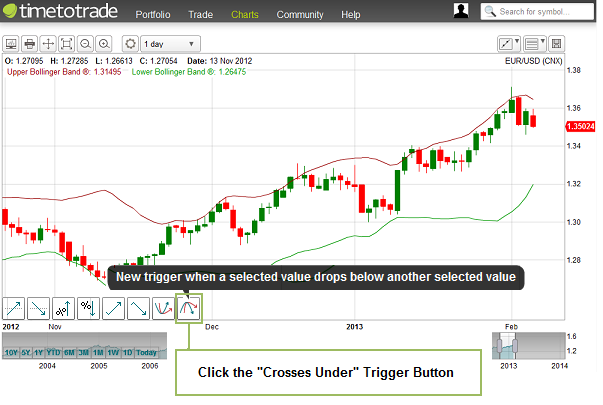 Negative Crossover Alert Trigger, is triggered when the Bollinger Band falls below / crosses under another indicator, price, a specified value or trend line that you have drawn on the chart. Step 2: Select the indicators from the drop down menus, in this example we will be notified when the candle close price crosses above the Upper Bollinger Band®. (Depending on your strategy you might choose to be notified if the candle Opens above the Upper Bollinger Band® or if the High Price crosses the Upper Bollinger Band®). Step 3: Click the "Activate" button. The green light to the left of the alert, indicates the alert is active (a red light would indicate the alert is paused). The next time the price crosses the Upper Bollinger Band® you will be notified by an alert sent to your email or mobile phone. If you wish to make any changes to the alert, click the right hand arrow, as indicated. 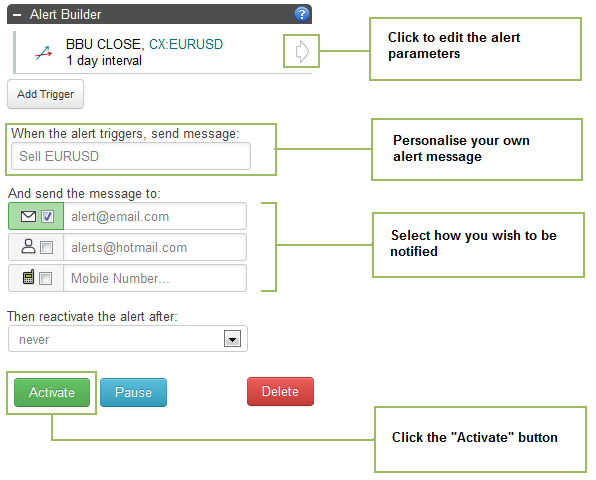 You customise the alerts to suit you: for example you can set for alert conditions to be checked with every price tick or at candle close, you can edit the alert message you will receive, decide how you would like to be notified and which email and/or mobile phone you would like the alert sent to. 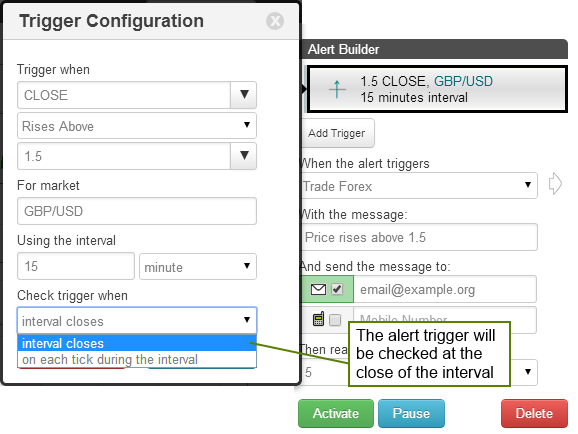 To create an alert that will be triggered and notify you when the price falls below the Lower Bollinger Band® (fluorescent green line), just click the "Crosses Under" Trigger button, customise and activate the alert as discussed above. The next time the price crosses the Lower Bollinger Band®, you will receive an alert to your email or cell phone.